Fun for 0-3's - Welcome to Blackduck Elementary Early Childhood Programs. We offer several programs including, ECFE, School Readiness for 3's and Voluntary Pre-K for 4's. 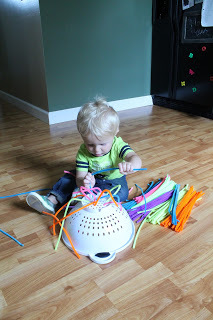 Lots of fun ideas to do with little ones! Learn the benefits of giving your little one a relaxing message. Find instructions on where and how to gently message your baby. Watch a how to video for those of you who are visual learners. My one year old loves to play with buttons and they are easy to collect. Look through all those old bags of clothes. Be sure to supervise this activity as it can be a choking hazard. Encourage your child's pre-reading skills with this fun activity. Put the bags together lining up the edges. Staple or tape the bottoms of the bags together leaving the openings free. If using staples cover the staples with tape for safety. Cut the manila folders, cereal box, or cardboard into squares that will fit into the baggies. Help your child find pictures he/she finds interesting and glue them to the squares. Make captions for the pictures and slide them into the baggies. Yay, a homemade book for your little one to enjoy!